This book explores the types of conflicts that occur over marine and coastal resources, the underlying causes, and attempts to prevent them. Despite the emergence of various marine and coastal governance approaches to address the effects of human activities within the marine environment, conflict continues. 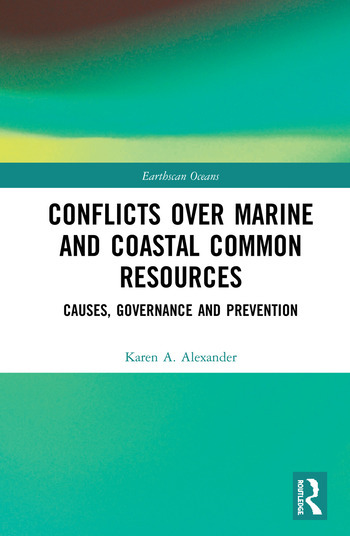 In this book, the author outlines the reasons conflicts can, and do, arise in the marine and coastal environment. Drawing on case studies from both the northern and southern hemispheres, the book takes a broad view of how we interact with our environment, of how and why conflict is perpetuated as a political and cultural phenomenon, and how this varies or remains constant across space and place. The case studies explore not only the underlying perceptions and needs of those involved in marine and coastal conflict and the types of conflicts that arise in oceanic and coastal areas, but also the underpinning reasons for these conflicts. Marine and coastal resource conflicts have the potential to derail conservation efforts and blue growth policies, as well as the United Nations Sustainable Development Goals. Thus, it is imperative we understand the drivers and exacerbating factors of marine and coastal conflict. Arguing that there is an urgent need for renewed thinking and focus on conflict prevention, the author develops a theory of marine and coastal conflict which allows us to understand those factors and the means to help prevent such conflicts arising in the first place. This book will be of interest to students and researchers of coastal and marine science and environmental management as well as those working in the field of marine resource management, including coastal zone managers and fisheries managers. Karen A. Alexander is a research fellow in the Centre for Marine Socioecology, and the Institute of Marine and Antarctic Studies, at the University of Tasmania, Australia. She is a political ecologist with wide-ranging interests, centring on marine governance. Karen specialises in issues around the transition to a blue economy and her research has focused on marine and coastal conflict, societal support for sectors such as offshore energy and aquaculture, coastal ecosystem-based management, and marine spatial planning.